The blogger currently known as "Lion of Zion"
Also, Rav Soloveitchik's Two Dreams at Hirhurim relates the point that just as the angels going up and down on the ladder in Jacob's dream were not two separate dreams, but components of one dream, so too, Rav Soloveitchik's mastery of both secular and Torah scholarship are but separate aspects of a single vision. This post made me smile, imagining an updated version of Jacob's dream. Instead of a ladder, the angles were going up and down a conveyor belt, all attached to the same device, part of the same mechanism, but resulting in individual angels oriented in opposite directions. Thank you again and again for all of your kind wishes and thoughtful comments. It's good to be back. I missed you, too! 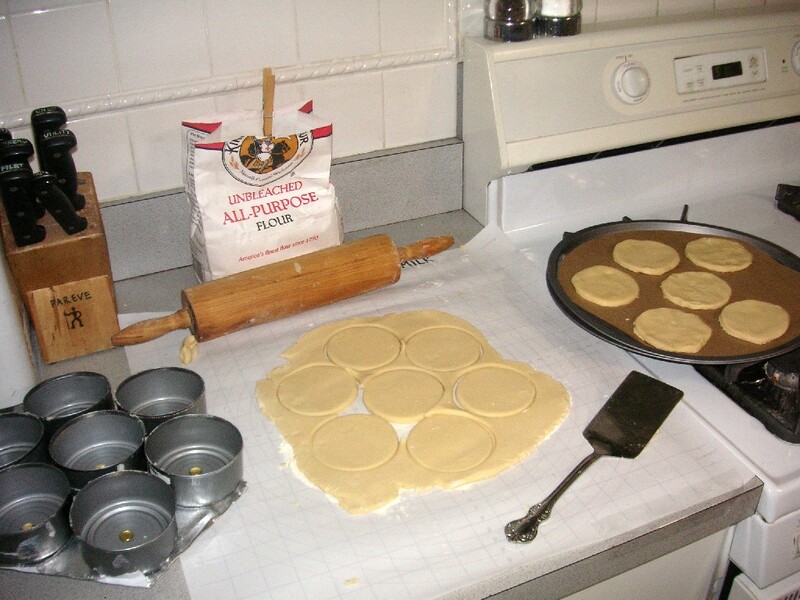 Have a cookie making marathon in your future? 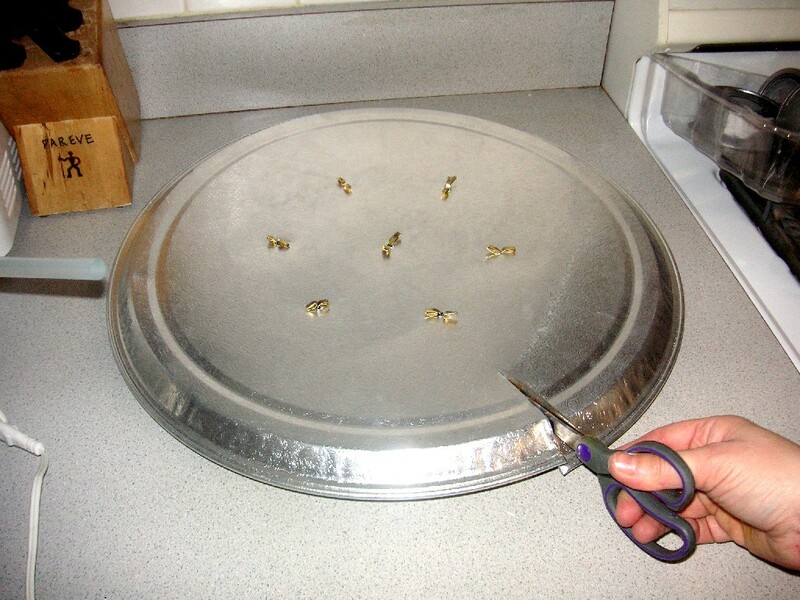 Invest a few minutes and make a bulk-cookie cutter, and save tons of time. 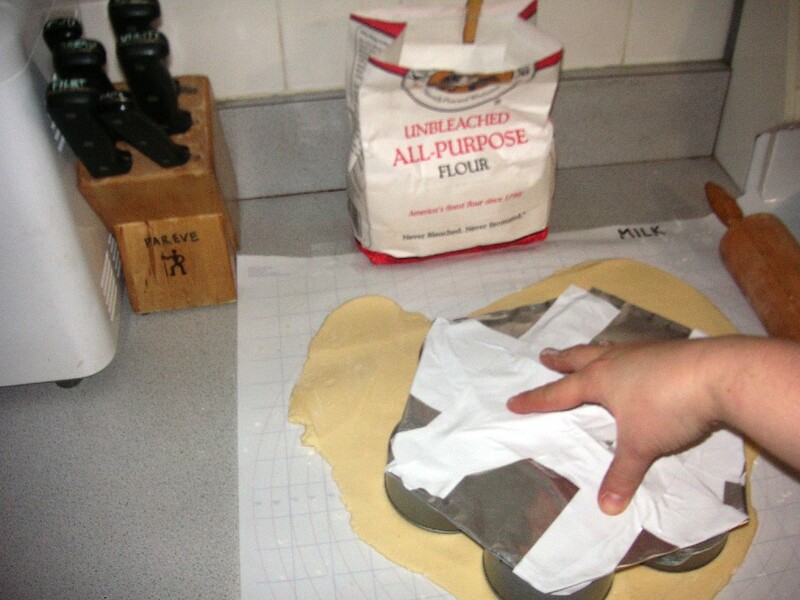 This bulk cutter uses the dough efficiently, and allows a bunch of cookies to be cut at once. The only difficult part is eating all that tuna! 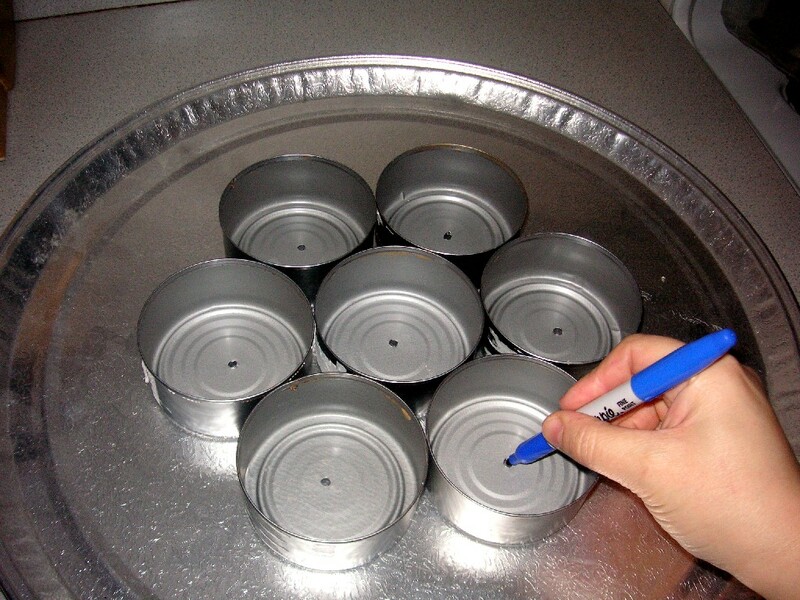 STEP 1: Collect and thoroughly wash a number of tuna fish cans. 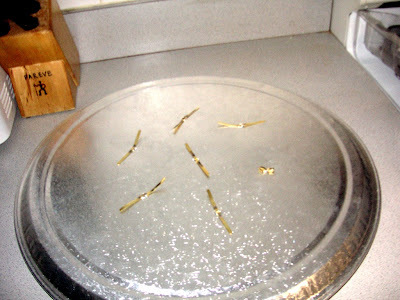 I soaked mine for a few minutes in hot water that had some lemon juice added to remove the fishy odor, then ran them through a dishwasher. 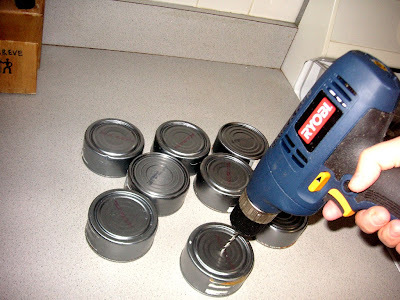 STEP 2: Drill a hole in the center of the bottom of each can. STEP 3: Mark the hole locations on the foil platter, grouping the cans as close together as possible. STEP 4: Drill holes in the platter at the pen marks. 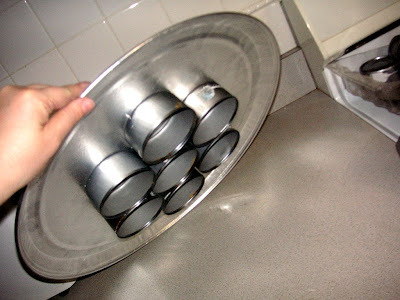 STEP 5: For each can, feed a brad through the hole in the can and the corresponding hole in the platter. 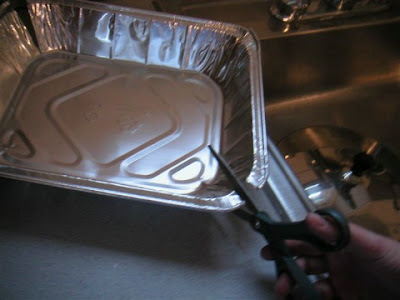 Open the brad on the back of the platter, pull tight and curl the "legs" of the brad to secure. 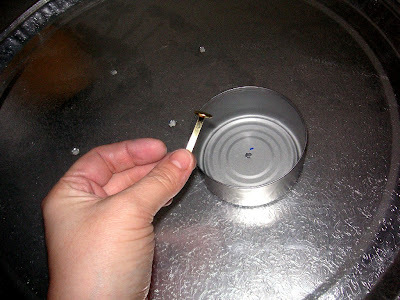 The cans should be able to spin, but not wobble. 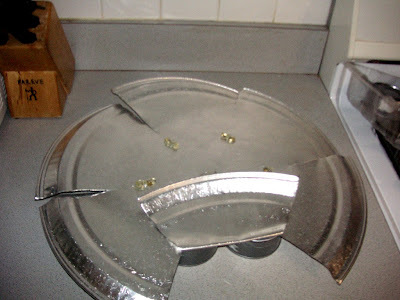 STEP 6: (Optional) I put a dot of hot glue from a glue gun on the back of the platter, to help secure each brad. This was probably unnecessary, but can't hurt. 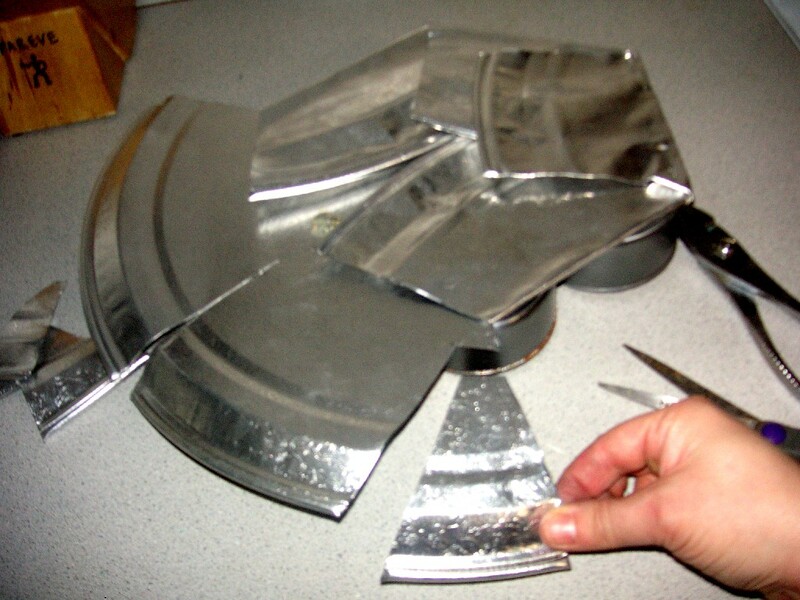 STEP 8: Fold two opposing "leaves" cut from the platter over the back of the platter. 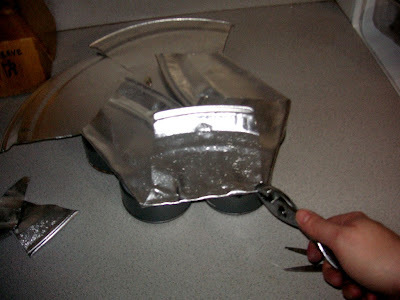 The idea is to reinforce the strength of the cutter and make it safe for pushing with palms (no sharp edges) when in use. STEP 9: After the initial two edges are folded in, snip (with scissors) a wedge from the edges of the remaining flaps (to reduce bulk) and fold them in to the back of the platter. I used a pair of pliers to help with the folding. 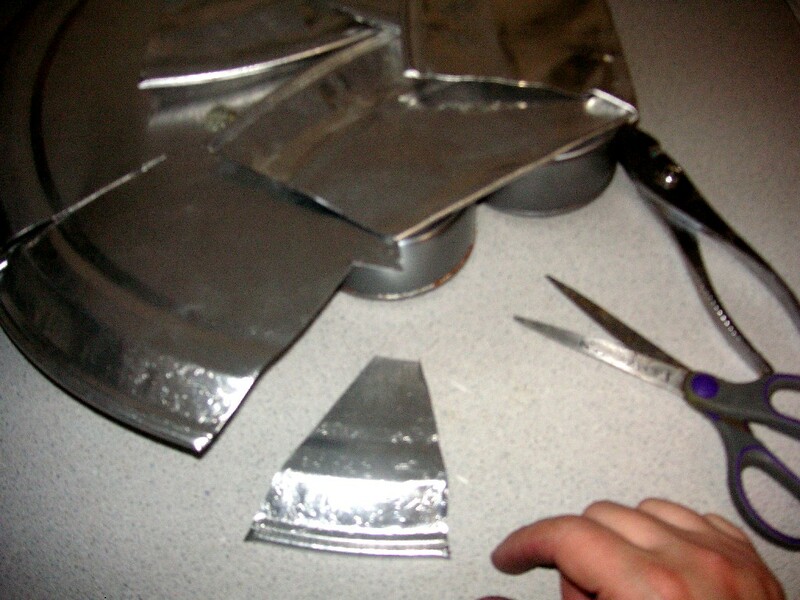 Make sure all sharp edges are removed and folded. 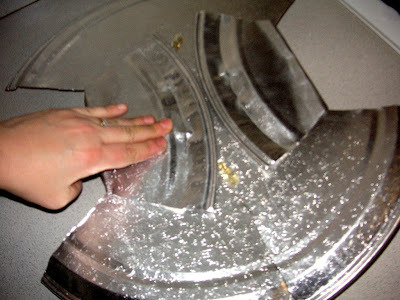 Your hands will be pushing on this device, and those snippets of aluminum can cut skin! 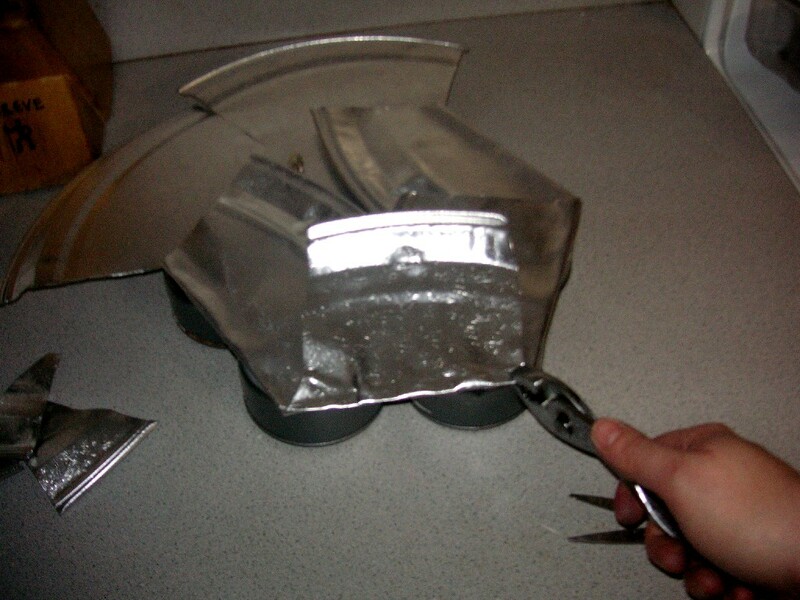 This is the shape of the wedge removed from the flap sides. 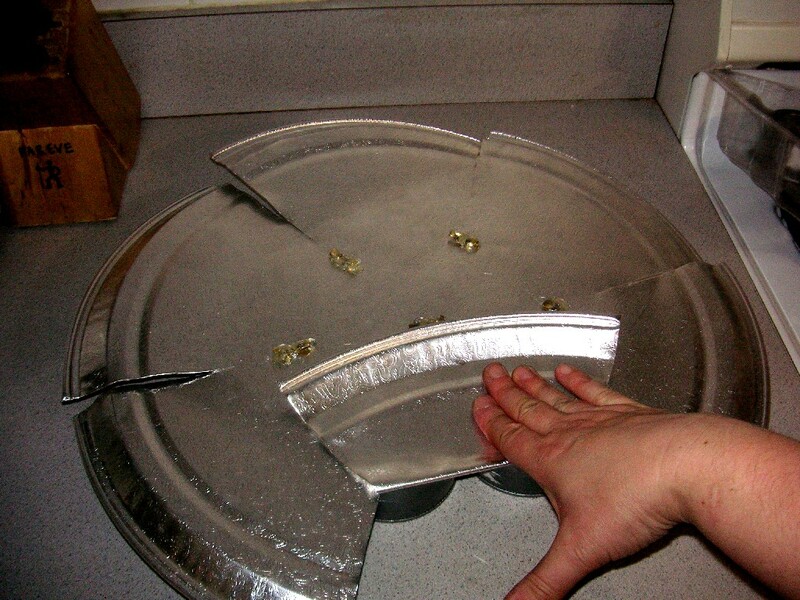 With six cuts, I had six flaps and six wedges. STEP 10: When all the flaps are folded over, crimp the folds with the pliers and cover the exposed edges with duct tape. STEP 11: Whip up some cookie dough and go to town! by Juggling Frogs at 6:27 AM 6 comments, so far. Add yours now! 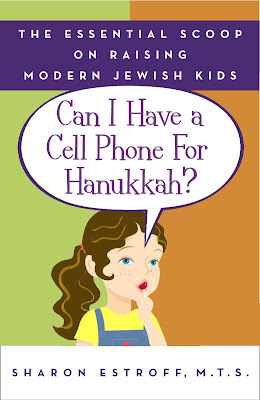 I recently received a review copy of of Sharon Duke Estroff's recently published parenting book "Can I Have a Cell Phone for Hanukkah?" In addition, Broadway Books generously sent along five additional copies of this book to give away to Juggling Frogs readers. If you're interested in receiving a copy, please leave a comment on this post. On the second day of Chanukah, Wednesday, December 5, 2007, I'll select five of those who have commented on this post at random to receive a copy of the book. "Can I Have a Cell Phone for Hanukkah?" is a cute and useful book, a quick read, written in a casual, breezy, reassuring tone, tailored for Jewish parents living in the United States with children enrolled in elementary school. Ms. Estroff, mother of four, Jewish educational consultant, and author of a nationally syndicated parenting advice column, writes with wit, candor, and authority. She brings issues and wisdom from her personal parenting experiences, those of the families at her day school, and those from her readers together in gentle, measured, moderate, and reasonable, contemporary guide to raising children. Heavily seasoned with Yiddish-isms and (perhaps one too many) references to bagels, the tone is non-denominational, observance-optional, and without dogma. The examples and approach are based on Jewish tradition, but offered on their merits as suggestions, rather than as religious imperative. While many orthodox readers will find a couple of chapters less applicable to their lifestyles (e.g. "Santa Envy") and encounter a few bewildering assumptions, there are a number of chapters that everyone can benefit from reading. In particular the chapters that address management of homework, extracurricular activities, toys, and navigating the elementary school social scene were quite on the mark. Home-schooling is not mentioned or considered. This is a book targeted to a relatively affluent, American audience of Jewish parents of elementary school-aged children. For example, the cell phone in the title of the book is assumed to be affordable, the choice to give it decided on extra-financial considerations. Atlanta (2001), Estroff knows something about Jewish kids (and their parents). by Juggling Frogs at 10:20 PM 15 comments, so far. Add yours now! by Juggling Frogs at 9:09 PM 1 comments, so far. Add yours now! by Juggling Frogs at 8:50 PM 4 comments, so far. Add yours now! by Juggling Frogs at 3:55 PM 2 comments, so far. Add yours now! I just read the speech William Safire wrote for President Nixon to deliver if the first lunar landing was unsuccessful. What would the world be like, if that speech had to be delivered? Reading that speech, I'm overwhelmed at what was risked in the quest for human achievement and knowledge. Our finite understanding of the world takes their success for granted. Notable amongst my father-in-law's many contributions to the world, he was in charge of the Command and Service Module on Apollo 11. Thus, all things moon-shot-related feel very personal to our family. The heroism of the Apollo astronauts affected the world, our country, and our family. Today is Veteran’s Day in the United States. This holiday was instituted to thank living veterans for their service, "to acknowledge that their contributions to our national security are appreciated, and to underscore the fact that all those who served - not only those who died - have sacrificed and done their duty." Every veteran represents a condolence letter composed, but not sent; an epitaph written but not inscribed. What would the world be if they didn't take that risk? My father-in-law escaped Nazi Germany in 1939. He was nine years old. His parents sent him and his eleven year old brother in a car with a driver, without luggage, to visit relatives in Holland. At the border, SS officers pulled the boys out of the car, beat them, and interrogated them about their parents' whereabouts. They didn't know. Thank G-d, they were released, and made their way to safety. My husband's grandparents followed the next day, dressed in evening clothes, using a similar ruse. They, too, arrived safely. Thank G-d. They left a country in which the family had prospered for generations, in which their great-great- grandfathers were buried, without plans or material possessions. Meanwhile, in the U.S., my mother-in-law’s father, aged 16, lied about his age, so he could enlist in the U.S. Army. My father-in-law made it to Palestine, and fought in Israel's War of Independence as a teenager. As a young adult, he came to the United States, again with nothing. To support himself, he moved refrigerators. Eventually, he decided to study engineering. He got his Ph.D., and worked for NASA. Heroes abound. Not only my debts, but my debtors are incalculable. This morning, I drove my son down dusty unpaved roads to the middle of a U.S. National State Park, to participate in a 10 mile hike with his shomer shabbat Boy Scout Troop. He came home this afternoon, cheeks red with enthusiasm and vigor. I looked at him, his kippah (yarmulke) and shirt covered in the dirt of the trail, and marveled at this miracle, this living victory, the direct result of the sacrifice, survival, and hope of so many. So today, I'm awash in images flags and tombstones, and the free soil they mark. From the family graves, to the flag of Israel, to the field of U.S. flags at Arlington Cemetery, to the flag Neil Armstrong planted on the moon, to the dirt on the embroidered U.S. flag patch attached to my son’s Boy Scout uniform. May I never take this ground upon which my family, my children, and our future stand for granted. May those currently at risk in the name of freedom come home safely, that all prewritten eulogies may be torn up for confetti. May we soon see the day, when the only heroes needed are those that offer themselves to further humanity's reach, rather than to escape from its grasp. by Juggling Frogs at 10:44 PM 8 comments, so far. Add yours now! 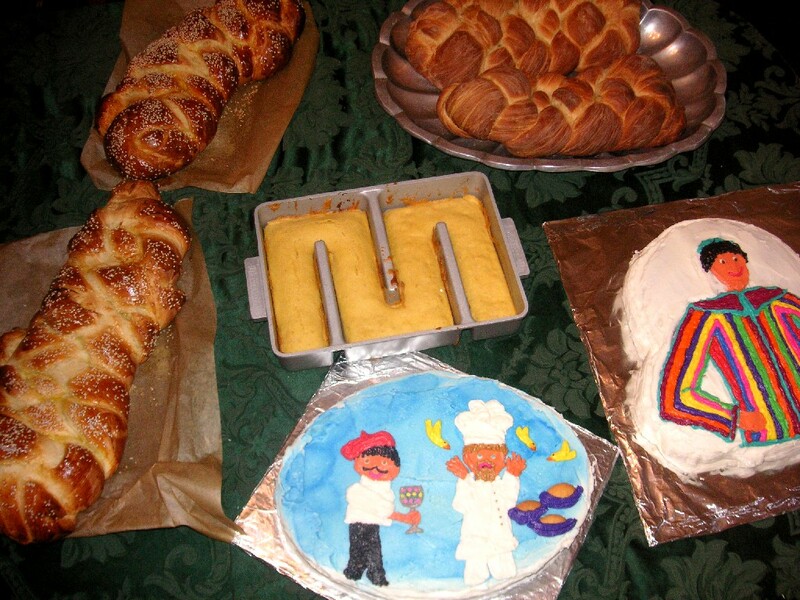 Oh, my, but Shabbat gets in early this week. 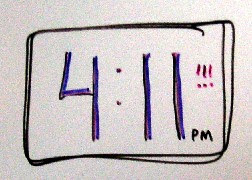 In Boston, now that Daylight Savings changes have been made, candle lighting is 4:11 p.m. today! Apparently, Amelia Bedelia is working for Wal-Mart now. Yet, learning new languages comes more easily to others. by Juggling Frogs at 3:58 PM 1 comments, so far. Add yours now! The victory isn't really over my napkin obsession, but rather over the storage of its resulting output. As I've mentioned, I have a "thing" for making dinner napkins. Maybe it's a clever and frugal way to add a touch of personality and elegance to our table. Or perhaps it's a barely controlled obsession. Most likely, it's a flimsy excuse to fondle fabric. We have a lot of napkins. We have dedicated dinner napkins for many holidays. I have matzah-napkins for Pesach, fall foliage napkins for Sukkot and Thanksgiving, Chanukah napkins, and Purim napkins made from a wonderful Robert Kaufman "Mardi Gras" fabric. I make them from (often clearance-table) novelty fabric in the children's birthday party themes. As you can imagine, with five children, a number of the themes have been repeated for multiple parties, an added bonus. We have napkins with cats, princesses, ducks, horses, dolls, Winnie the Pooh, numbers, machines (for Jonathan's "engineering" themed 10th birthday party), butterflies, various sports, bears, and bats (the winged mammal). I've also made a bunch of generic birthday and celebration napkins, just in case time, inspiration, or the fabric store is unavailable. I have sufficient out-of-the-way storage for these "special occasion" napkins. 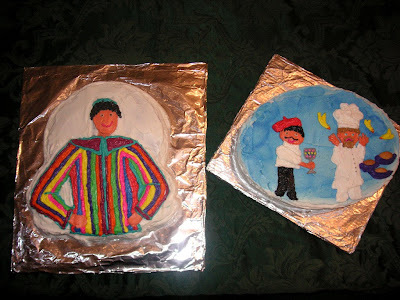 I even have room for a few more birthday themes, just in case someone chooses something not covered by the above list. The children enjoy re-using their special napkins throughout the year, as a special treat, for minor celebrations, such as a great test score, or to make the breakfast table special for a sleep-over friend. It isn't hard to retrieve them for special occasions. 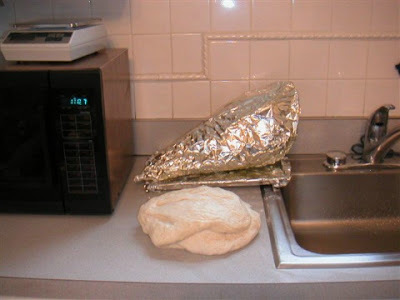 The storage problem was with our everyday/shabbat napkins. I find it hard to pass by a beautiful fabric on the clearance table without considering how it would look as dinner napkins. 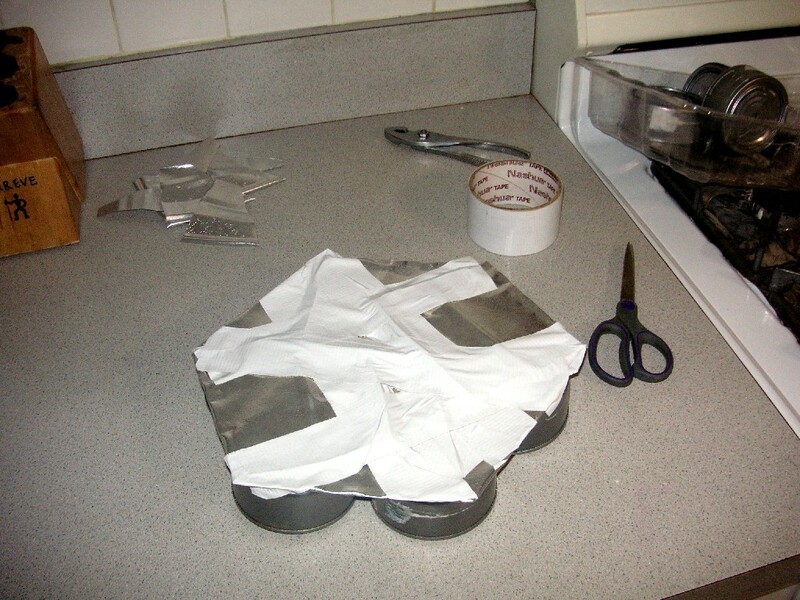 When a favorite tablecloth tears or stains, it's hard not to salvage its remains for the napkin stockpile. 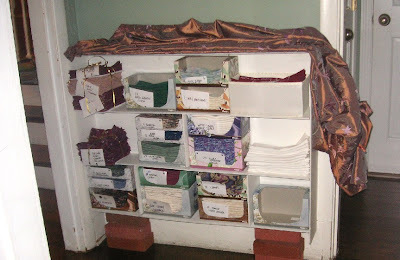 For the past seven years, I've kept the everyday napkin cache in a free-standing shoe organizer, on a high shelf in the mudroom. Each shoe-hole holds about 3 dozen napkins. It worked well enough, but it was a bit too high up for the children to reach (I have to stand on a chair to reach the top compartments), and the build-up surplus hoard inventory has outgrown it. But therapy will have to wait. 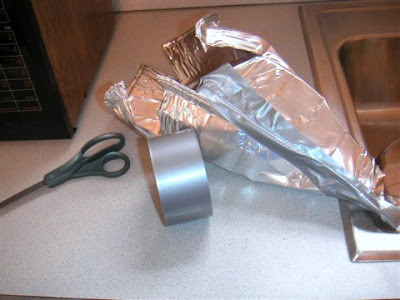 I've found a much better answer, the offspring of the marriage of my napkin hoarding and my other favorite obsession: recycling packaging materials. After 13 years of sending my kids to school, I'm physically incapable of throwing away an empty egg carton or tissue box. I get hives when forced to discard plastic berry containers. It's not that I'm such an environmentalist, but rather that I'm in touch with my Inner Toddler: I often enjoy the box as much as its contents. It's not only my fault. The teachers are complicit. 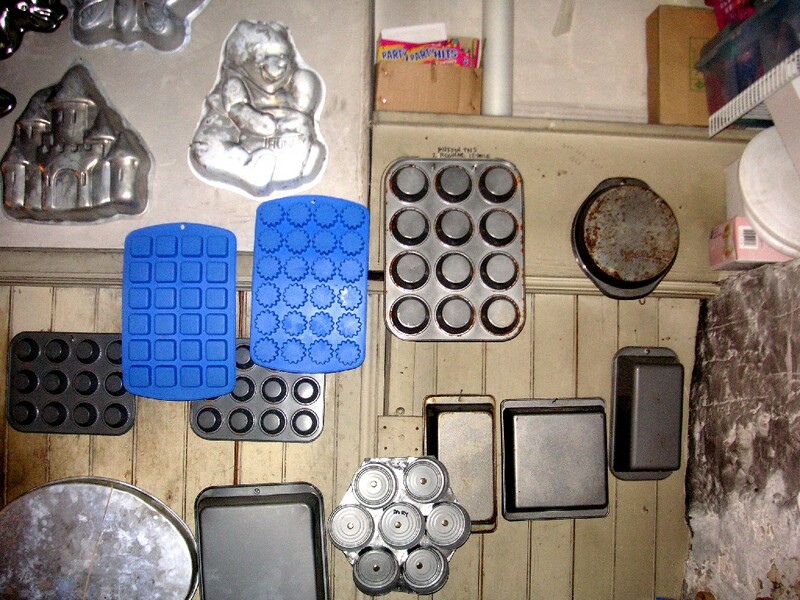 They encourage and reward my hoarding behavior, accepting this stuff gratefully and sending the children home with fantastically creative and educational projects made from it all. When I see what they can do with a paper towel tube, it becomes impossible to throw one away. 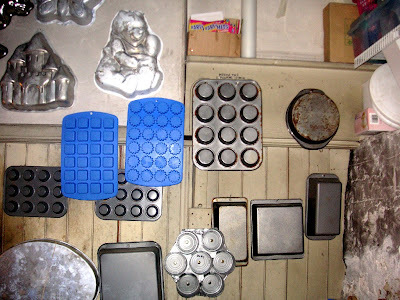 One reason I don't home-school, is that I need the school as a recipient of my bounteous collection of egg cartons, berry boxes, fabric scraps, shopping bags, oatmeal canisters, and bottle caps. We'd have to rent an apartment, leaving our home to house the warehouse of "good garbage" if I had no way of reducing its stock. That is why I just happened to have, on hand, over a dozen empty Kleenex boxes. On Tuesday morning, I moved the Kleenex box pyramid designated for the kindergarten from the dining room table, in order to sit down with a great audiobook and finally attack the napkin ironing backlog from the holidays. So, I moved the boxes to our front hallway to await their transformation to objects d'arte. This hallway is about eight inches wider than its doorway, leaving a dead space of about 5.25" on one side and 2.75" on the other. I know these dimensions by heart, because I've measured dozens of times in the eight years we've lived in this house. Wasted space in such a central location bugs me, in principle. Finding a 5" deep shelving unit and a useful purpose to match this spot had eluded me. Until Tuesday morning. Gretta looked at me curiously as I squealed in satisfaction at two simultaneous wonderful discoveries: The Kleenex boxes fit perfectly in the hallway, and the ironed napkins fit perfectly in the Kleenex boxes. She followed me upstairs, as I collected supplies, including a pair of 30" x 40" foam core boards (cost: about $11). Her excitement matched mine, until she learned I wasn't building yet another dollhouse, but rather something for myself. I'm (almost) embarrassed to admit how happy this made me. The napkin overflow is stored conveniently, the hallway dead space is used, and the Kleenex boxes are recycled. And I can pretend that I don't qualify for a jacket that ties in the back for just a bit longer. Brick "legs": The bottom shelf is mounted two inches above the bottom and back walls, allowing "legs" made of stacked bricks to hold it stably in place. The depth of the foam core & Kleenex boxes is just as wide as the hallway, but about half an inch wider than the hallway at the floor, due to the floor wall boards. The brick "legs" are just taller than the floor wall board, allowing for the floor under the foam core shelves to be swept. 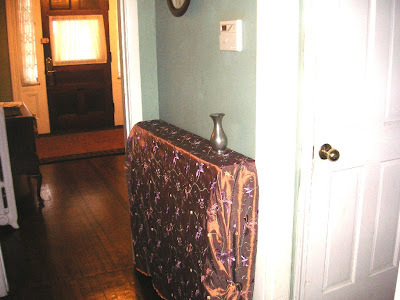 Fabric cover is not yet finished/hemmed, as I hope to install a "real" wood shelf with brackets about a foot above the foam core, and cover that. This will give another shelf of storage, and prevent heavy objects from being placed on the foam core structure. Fitted top shelf: Above the foam core shelf, I made a separate layer of foam core, cut to fit exactly inside the molding and with a rounded edge at the corner. This made the shelves look built-in, when hidden by the fabric. 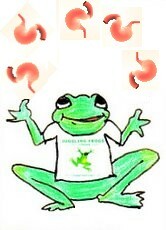 by Juggling Frogs at 8:05 AM 4 comments, so far. Add yours now! 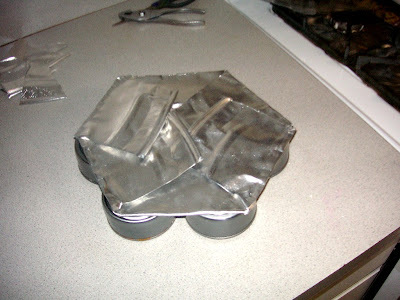 Cut a foil pan's corners so that it will lie flat. 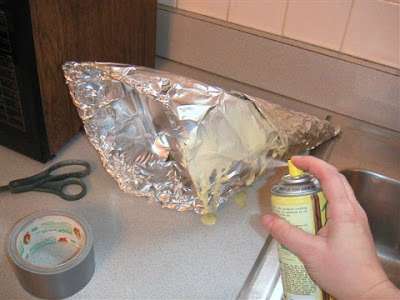 Roll the foil pan into a cone shape and secure with duct tape. Be careful, the cut edges are very sharp. Cover with heavy duty aluminum foil. 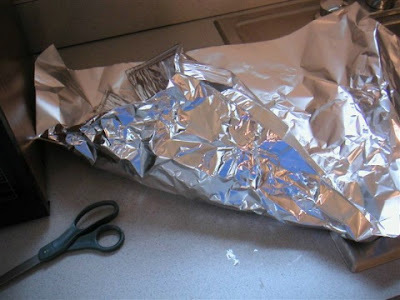 Place oiled foil mold on a cookie sheet and make a large recipe of bread dough. 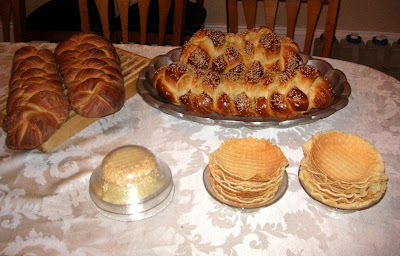 I used our regular Yekkish/Water Challah recipe this time. 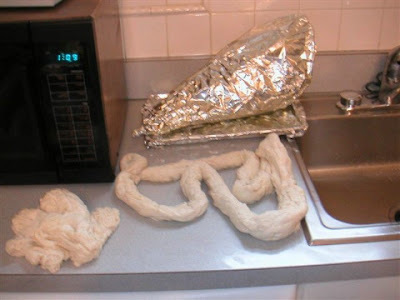 Roll the bread into long, thin snakes. 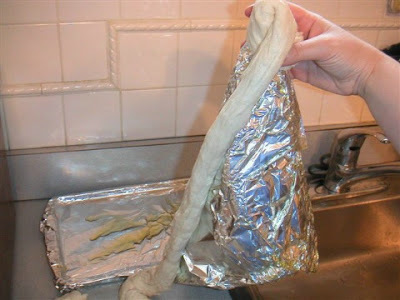 Starting at the tip, wind the dough around the oiled foil cone. 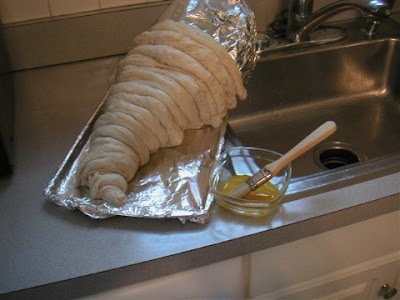 After allowing to rise a bit, brush with diluted egg yolk and bake until golden brown. I put the "flowing abundance" on a clear tray so we can move it easily when clearing the table. 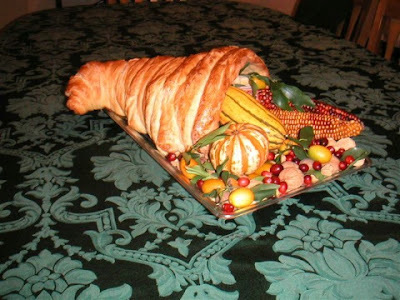 (From 2004) Including the ornamental Indian Corn, but not including the reusable nuts and vegetables, this (theoretically edible) centerpiece cost less than $3 to make. by Juggling Frogs at 6:29 AM 12 comments, so far. Add yours now! In this week's parsha, Toldot, Esav asks Yaakov to "give me some of that red, red, stuff" and sells his birthright for a bowl of lentil soup. 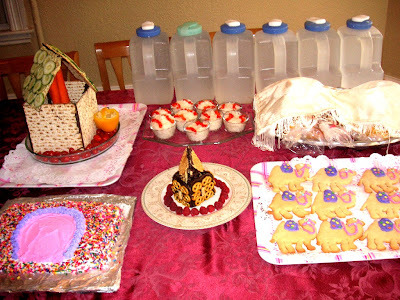 Thus, our menu for Parshat Toldot includes lentil salad (quick cheat: prepare lentils and add a container of salsa to taste), lentils added to the cholent, and we have "lentil soup cupcakes" and fruit bowls to supplement dessert. The plan is to make Lentil soup cupcakes are made from yellow cake mix with a few red food coloring drops, dipped in melted chocolate to make the "bowl" once the cupcakes have cooled. I'm attempting also to make some waffle cone bowls, that I plan use to serve red fruits and berries (strawberries and raspberries, perhaps apple crumble with cranberries, time permitting) with optional whipped topping for those not counting calories. by Juggling Frogs at 12:06 PM 1 comments, so far. Add yours now! 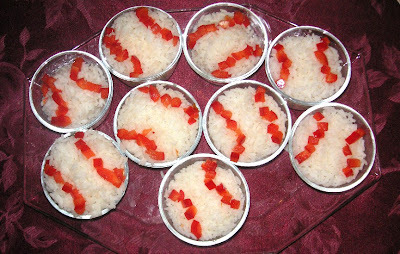 Tonight's menu celebrates the Red Sox victory, as well as the weekly parsha. I'd like to extend my thanks to Jon Abbett and his family, for sponsoring Shabbat Morning Kiddush at our shul "with thanks to the Almighty for the kindness He has bestowed upon the 2007 World Champion Boston Red Sox." Ezzie also points to a beautiful and inspiring post by The Corner Point called Human Becomings. It moved me so much that I forwarded it to our school's kindergarten teachers and two people who are planning to teach at the kindergarten level. by Juggling Frogs at 1:59 PM 3 comments, so far. Add yours now! by Juggling Frogs at 9:30 AM 4 comments, so far. Add yours now! by Juggling Frogs at 11:03 AM 1 comments, so far. Add yours now!